Sunrise Sunset does exactly what its names says for iCal. It computes the times the sun rises and sets and produces an iCal calendar containing those events. It is based on a little Basic program that did the sunrise and sunset calculation and has been gussied up with a better user interface and an iCal output back end. It is moderately accurate, so unless you are timing your sunrise or sunset experience to the minute, it can be quite useful. The interface is simple. You enter your latitude and longitude. Go to Google if you can't figure these out and don't have a GPS. North latitudes are positive; south latitudes are negative. East longitudes are positive; west longitudes are negative. Those are the coordinates for Port Angeles, WA in the example to the left. The minus eight is the number of hours difference between the local time zone, U.S. Pacific Time, is from Greenwich Mean Time (GMT). If you are in an area with daylight savings time, check the box. 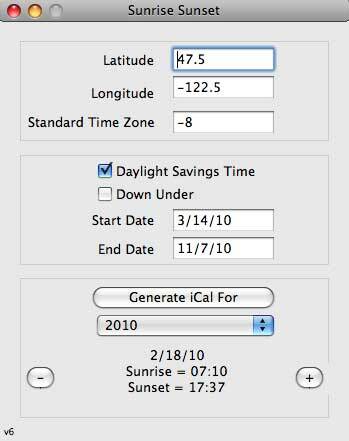 The start and end dates are defaulted for the current, 2010, U.S. daylight savings time which may change at the drop of a hat. Watch out for hats dropping. The "down under" flag is for places like Australia where summer straddles the year boundary rather than winter as in the northern hemisphere. Yes, we considered just checking the sign of the latitude, but that kind of thing just leads to bugs and more bugs. There are some awfully weird countries south of the equator, some as strange as those north. The program generates the iCal calendar (ics file) for one year at a time. Just specify the year with the pulldown menu and click the generate button. Put the file where you will and double click it to load it into iCal. We recommend loading it into a new calendar, but de omnibus non est disputandum and all that. To download the latest version for the Macintosh, click here. For more Kaleberg Symbionts software, click here.